Also, this is the second year in a row I've bought a wig for Halloween. But don't you agree that my 100% silk blouse for $3.75 from Goodwill is very of the moment? Ah ha, ah ha ha ha! I love that you were Rose. She's my fave. Rose was always my pretend name during childhood. That's awesome! I can't believe the outfits and the hair. Especially that jumper or connecty suit or whatever you call that thing that "Blanche" is wearing. I remember watching the Golden Girls when I was little. It was on at an awkward time right before or after a show I really liked like Who's the Boss or something like that. I didn't really enjoy watching it though. I never thought Sophia was funny. At all. but maybe if I were older and not under the age of 12 I would've gotten a "hoot" out of it. Pretty good, but rose looked a lot younger than that in the TV show. Best. Picture. Ever. Seriously, what are you gonna do with TWO wigs? 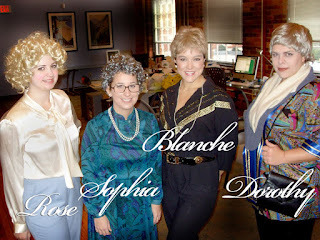 I'd be Blanche if I ever got to dress up like that. Not cause I am at all like her, I'm totally opposite, but because she has such a great signature walk. And, I'm young, at least I feel young at 33 and I totally remember that show. I still sometimes watch reruns. You are RIGHT, I think you can buy that exact blouse at any retailer today but you'd pay a heck of a lot more than $3.75 - love the costumes! Girl, you and your pals are a hoot. Great costumes... and fab blouse.